Rice may be off-limits when you’re trying to cut carbs, but there’s a simple, filling solution that offers more nutrition for fewer calories. 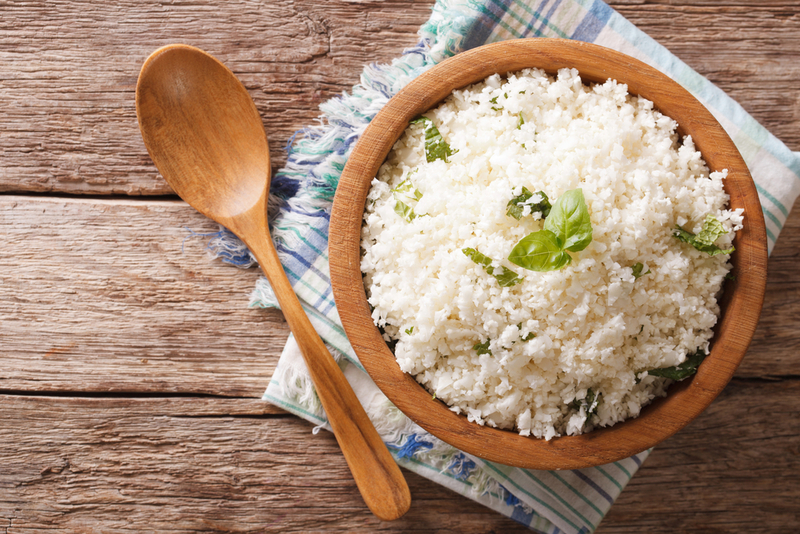 Riced cauliflower is relatively easy to prepare—just place the florets in a food processor and chop roughly—and is loaded with health benefits but has only 25 calories per cup. Part of the cruciferous family that includes kale and broccoli, cauliflower is high in cancer-blocking sulfur compounds and fiber, as well as essential nutrients like vitamins C and K. Its firm texture holds up well for light stir-frying or pan frying, and its neutral taste means it’s the perfect base for whatever flavors you care to throw at it. 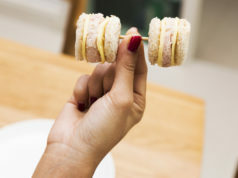 Try one of these easy recipes for a quick, clean meal tonight. Traditional sweet-and-sour chicken is breaded and deep-fried and also calorie-rich from excess oil and lots of white rice. This version cuts out hundreds of calories while adding plenty of nutrients. Rice cauliflower by placing the florets in a food processor and roughly chopping. You will need to do this in two batches. Warm 2 tbsp oil in a large skillet over medium heat, then add chicken, peppers, and onion. Cook 4–5 minutes, stirring occasionally until vegetables soften and chicken browns. Transfer to a plate. Add remaining oil to skillet, placed over medium heat. Add riced cauliflower and cook 4 minutes more, stirring occasionally, until cauliflower begins to soften. Add orange zest and juice, soy sauce, and stevia or honey. Toss well and top with chicken- pepper mixture. Serve immediately. If you adore spicy fermented foods, this flavorful Korean-style cabbage rice will soon become your new fave. Kimchi also contains good-for-your-gut flora—helpful probiotic cultures that feed your body’s microbiome. Rice cauliflower by placing florets in a food processor and roughly chopping; you will need to do this in two batches. Warm oil in a large skillet over medium heat. Add scallions and half the kimchi; cook 1–2 minutes, stirring often. Add riced cauliflower and stir, cooking 4–5 minutes more, until cauliflower softens. Stir in peas, corn, and vinegar. Top with remaining kimchi and serve. Classic risotto takes close to an hour to prep. This nutritious version can be on the table in less than 10 minutes. Heat oil in a large skillet over medium. Add onion, mushrooms, garlic, salt, and pepper; cook 4–5 minutes until veggies begin to brown. Transfer to a plate. Cook cauliflower over medium 4–5 minutes, or until it softens. Turn heat off. Stir in mascarpone or cream cheese and half the parmesan. Top with mushroom mixture, sprinkle with remaining cheese, and serve. Sweet coconut and crunchy cashews are a flavorful pair. Cashews are high in copper, a mineral important for collagen production. Fiber-rich coconut contains filling fats and a sweet taste that’s perfect with cauliflower. Warm oil in a large skillet over medium heat. Add garlic and cook 1 minute, stirring often, until it becomes fragrant. Add cauliflower, cashews, and curry powder; cook 4–5 minutes until cauliflower starts to soften. Stir in soy sauce. Sprinkle with coconut, basil, and pomegranate seeds. Serve immediately. Rice and beans are a staple of many international cuisines, but this version made with cauliflower contains sulfur compounds that are important for liver detox and folate, which plays a part in breast- cancer prevention. Warm oil in a large skillet over medium heat. Add onion, cilantro, chili powder, cumin, salt, and pepper, cooking 4–5 minutes, until onion starts to brown. Stir in cauliflower and cook 4–5 minutes, until cauliflower has softened. Top with beans and serve immediately.